A couple of days later at the beach, we sliced into a well-chilled honey dew and I can tell you it was one of the best I have ever had locally. Superb and worth every centavo of the whopping PHP90-100 price I paid for it. 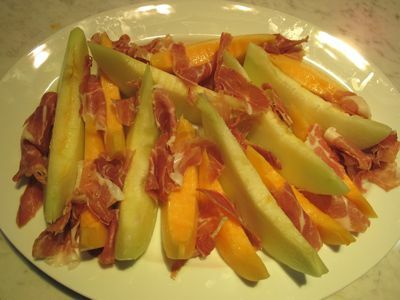 We sliced into the cantaloupe and it was nearly as good so we opened up the prosciutto and put together this simple platter as a starter for dinner that evening. YUM. 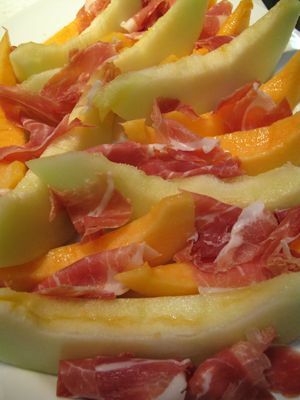 There are few pairings as classic and as delicious as prosciutto with melon. 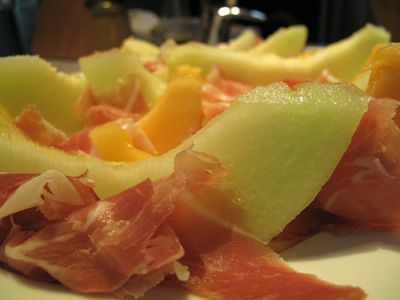 The saltiness of the prosciutto enhances the sweetness of the melon. And oddly, if the melons are just right and the prosciutto of decent provenance, there is a sweet undertone to the salted meat that emerges when you put both in your mouth and everything blends together. Simply perfect. Match made in Italian heaven! Pair with a glass of Sauvignon Blanc, Heaven! Are you going to try the prosciutto with chicos too ? Aside from the melons, what would be a great pair for the prosciutto? You take really wickedly good photos, MM. to the Philippines in abundance.They grow them huge in Italy. enough as sweet as Pineras. It looks so good.. im starting to salivate with this pair.. YUM! YUM! Arrrrrggggghhhhhh!!!!! I am greener than the green honey dews with envy!! known to Malaysians as hiong lei, try it with prosciutto. pears and Asian pears so they have the sweetness of Asian pears against the firmness,crunchiness and not-so waterlogged juiciness of Euro pears plus the fragrance to complement Prosciutto. So now I get to dream of finding the perfect Prosciutto. authenticity of Italian Prosciutto which are perfectly salted but allows you to taste the sweetness of the meat and the aroma of the sweet breezes of the area it was cured in. “You must have done something good” as they say. Local honeydew melons are not consistent in quality, while cantaloupe melons are available only during dry season. You could also try hami melons, available all year round, more consistent sweetness, although more expensive than honeydew. Yum. Prosciutto with honeydew, or with Anjou pears… just two of those things where the whole is greater than the sum of its parts. That is a perfect summer meal MM, and a glass of sauv or a chilled prosecco, you can watch a glorious sunset at the beach, feel like the king of the world. Looking forward to how you used up the fat! Carbonara? or crisped up and topped onto monggo? D…r…o…o..l! Pardon the dripping saliva. We have a chico at home but I’m still wary of trying it with prosciutto which I could buy at Galileo (100 meters away). TO: catahoulamom: Thanks, here on Guam we get a steady supply of persimmons coming from Korea. Will try it later. Mmm, first picture pa lang, I salivated na. Yum! Well done finding a ripe melon in the Philippines! I have virtually given up finding here what is one of my favorite fruits that is worth eating. We get our prosciutto locally in Iowa, by La Quercia. We will be going home this Pasko. I can bring them to whoever is interested, will appropriate some luggage space for it for MM foodies. Details to follow if there is interest in this. It’s 11:16 pm and I am craving prosciutto and melons. Arrrggghhhh!! This is what I get when I check this blog before going to bed! If the prosciutto made by La Quercia is made from Berkshire pigs and has been very favorably rated, I wonder how much yummier it would be if it were made from Mangalitsa pigs? Mmmmm. . .
Marketman…these are the perfect combi…try Hami melon…so good too. Wonderful!! Oh dear piggies, whose only reason for being is doomed for the stove top, the roasting pit or the smoke house! But then, who will eat the kitchen scraps? miss guia, am interested to order prosciutto…how much would it cost? Stay away from cantaloupes with the stem still attached to it. Unlike watermelons that you can tell if it’s ready by looking at the underside (the one that rests on the ground…should be YELLOW and not creamy white), ripe cantaloupes should SLIP off the vine easily….ripeness index. But of course, some growers minamadali nila for the market and cannot wait for the melon to slip off the vine. Prosciutto (or similar hams) with melon are classic, but in the past few years I’ve just as often paired prosciutto with papaya. Terrific combination! kurzhaar, that’s novel, I should try prosciutto with papaya as we have abundant supplies of papaya here. Booey, I got them at the FTI Saturday market. Another prosciutto and fruit combination that I would suggest is with FIGS. I have tried this when I was visiting an Italian friend who was living in the island of San Erasmo in Venice. He had fig trees all over the place and were they so sweet and succulent, very different from those coming from Turkey. Another bit of info, the kamote (or sweet potatoes), is being cultivated nowadays in this little island (and towards the mainland) and is slowly changing the some of the agricultural panorama of this region. It is getting to be quite a prime and sought-after commodity, so I wish Filipinos would reconsider the thought that kamote is a lowly crop. And thanks betty q. for the info about cantaloupes! JCo, proscuitto from Segundo Piso/Terry’s at Podium or Makati should be okay, or Galileo Enoteca in Mandaluyong or Pasong Tamo. Santis is probably okay. The quality of the melons is more difficult for me in Manila… The zucchini dish goes well with most grilled or baked items… you might want to look back into the archives for prokchops patterned after ones we had in Greece… easy and delicious. jade186, prosciutto and fresh figs… superb. Or figs with bacon baked in the oven, also super yummy!